From the Latin "completorium," the prayers of Compline signify the completion of the day and the petition for God's protection for the onset of night. It is a prayer for peace and a time of blessing. Cistercian monks and nuns throughout the centuries sing the "Salve Regina" or "Hail, Holy Queen," a final hymn to the Blessed Virgin Mary. 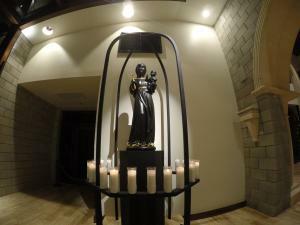 A replica of the miraculous statue of Our Lady of Einsiedeln adorns the east end of our abbey church. We invoke Mary as an image of the Church wholly given to Christ. As the monks settle in for the night, the abbot sprinkles each of his monks with holy water as a reminder of his baptismal comittment.